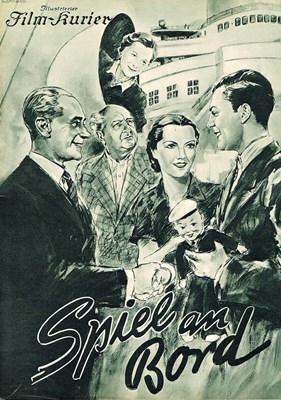 The savvy chauffeur Viktor Mueller has been hiding as a stowaway on a luxury steamer to America. Also on board are the two impostors, the Marquis de la Tours and Baron von Western, always on the lookout for new victims. They smell easy prey when they meet the wealthy Mr. Henning and manage to win his trust. De la Tours tells Henning, who wishes to sell a valuable stamp collection, that he knows President Corner, who is also onboard. Corner is traveling under the name “Miller” and he is supposedly very interested in the stamp collection. De la Tours is mostly interested in the fat commission he’ll get, if he can somehow bring the two men together. Corner, who, of course, knows nothing about all of this, has in the meantime become friends with Viktor Mueller. And so it also happens, that de la Tours confuses Mueller with Miller (Corner) and instructs the young secretary Susanne to make contact with the alleged president. This confusion at first leads to some amusing complications; but when the crooks learn that Mueller has been leading them around by the nose, things get really dangerous for the innocent chauffeur.